A few weeks ago I was in the stacks on some bibliographical errand relating to modern acting editions of Julius Caesar, when I took a moment to appreciate that nearby on the shelf were several seventeenth-century quarto editions of the play. One was dated 1684, another 1691, and between them, intriguingly, were four undated editions. Shelved as they were among old transfers from Widener, I wondered if the HOLLIS records for these Restoration era quartos were really up to snuff. In the case of the editions dated 1684 and 1691, it is gratifying to report that the HOLLIS records were fine, if not up to the standard they might receive if the library acquired them today. Author, title, imprint, date, extent, a few notes and references were all present — these were decent records. The four undated editions, however, needed some attention. Above is the HOLLIS record for 13408.108.5, one of the four undated quarto editions of Julius Caesar, as I found it. The author, title, and imprint are all fine, but the record lacks the details which would distinguish it from the other three undated quartos, each similar in appearance but printed from completely different settings of type and thus bibliographically distinct. 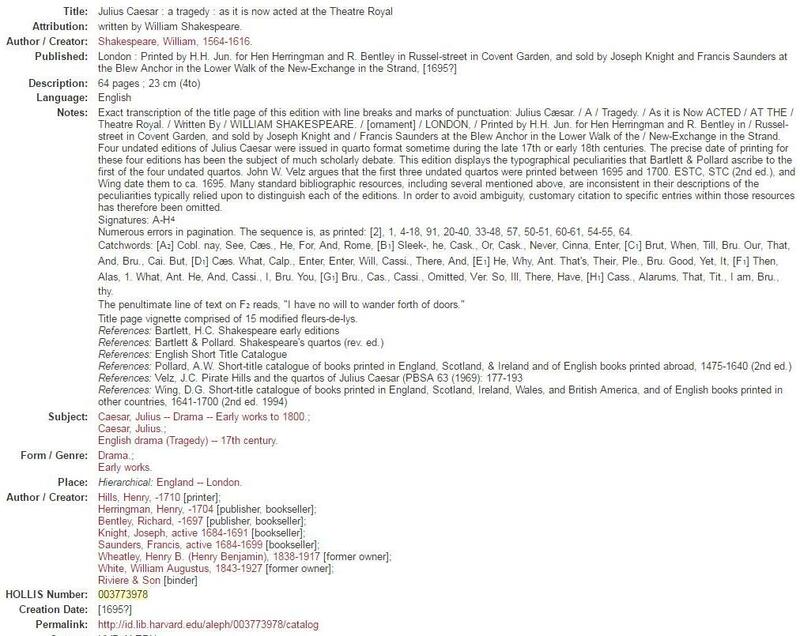 Worse is the omission of a date of publication, effectively hiding the books from any HOLLIS user who might be looking for all editions of Shakespeare’s Julius Caesar published within a range of dates. Here is the same record after I was through with it. Once I had identified the typographical quirks which distinguish each of these similar but distinct editions, there was of course no need to perform exhaustive cataloging from scratch. Shakespeare tends to be well trodden territory, and sure enough there were in OCLC robust and detailed records for some of these editions, which I could import. Most of my work entailed the addition of access points for the features unique to the Houghton copies, notably their provenance. All six of the Julius Caesar quartos discussed here come from the library of William Augustus White, class of 1863, whose monumental collection of early English books was presented to Harvard in 1929. 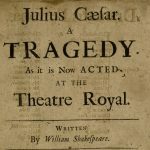 Julius Caesar was first published in the 1623 folio edition of Mr. William Shakepeares Comedies, Histories, & Tragedies, the “first folio”, and again in the 1632, 1664, and 1685 editions of the same. One of these quartos, however, represents the first appearance of the text as a separate, individual play. Which is it? When exactly and in what order, were these quartos published, and by whom? These questions, I found, have a long and well documented history, and some of them await definitive answers even today. W.A. White believed he owned a Julius Caesar first edition, and own one he did, but as it turns out, he and the authorities on whose judgment he relied were probably mistaken as to which quarto that distinction truly belongs. What follows is a mere chronology of scholarly opinions – I won’t be recapping in detail the bibliographical points involved, but links to the articles are below, for those with an appetite for the nitty-gritty of line endings, type settings and the like. 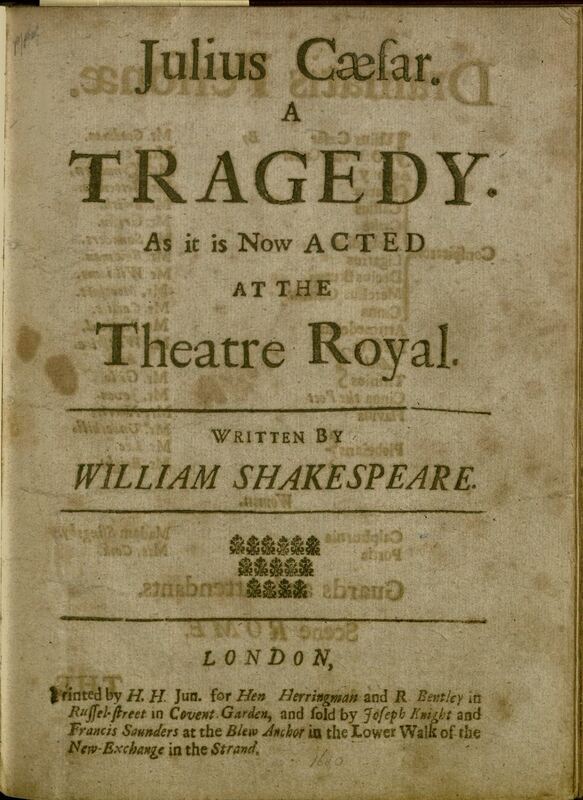 There is in Gerard Langbaine’s Account of the English Dramatick Poets (London, 1691) a contemporary reference to a quarto edition of Julius Caesar: “this play was reviv’d at the Theatre-Royal, about fifteen Years ago; and printed 4ᴼ. Lond. 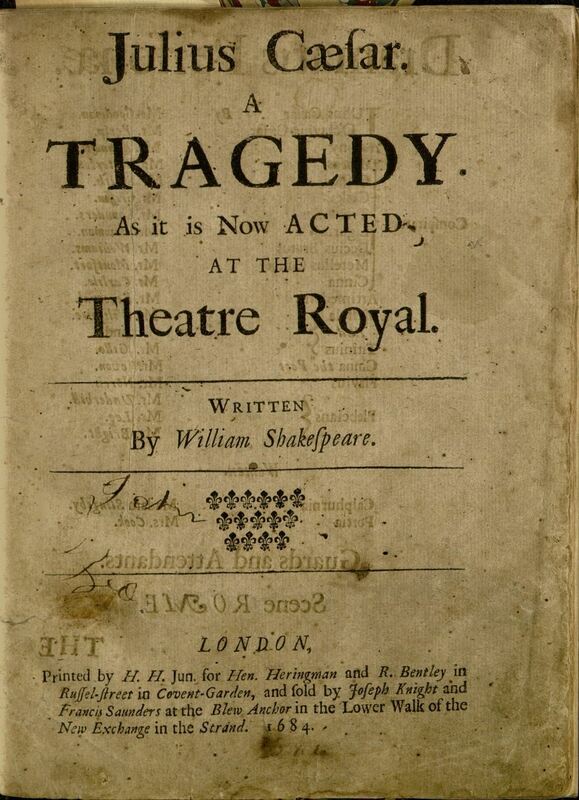 1684.” Fast forward to 1832 and we have theatre historian John Genest implying in his postscript to a Drury Lane cast list the existence of a pre-1684 edition: “the edition from which this cast is copied is without a date. Langbaine says that Julius Caesar was re-printed in 1684.” We can read this a few different ways. Was Genest misremembering what he had read in Langbaine, or does he perhaps mean reprinted only in the sense of being reprinted from the folio editions? Genest had in hand an undated Julius Caesar quarto, that much is clear, and if he supposed it preceded the 1684 edition, he does not tell us why. As it happens, an undated Julius Caesar quarto signed and dated by Genest found its way into the collection of W.A. White and therefrom to Harvard, being one of very copies discussed here. 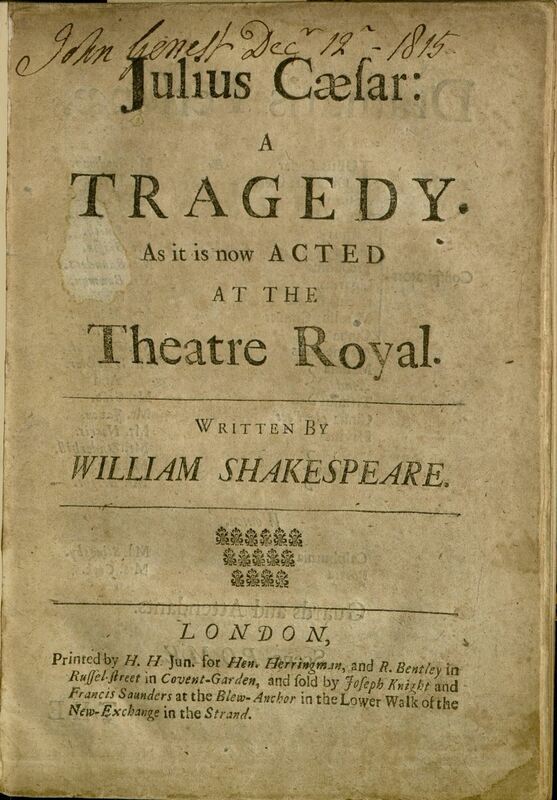 Now thought to have been printed around 1695, it may well be the very copy from which Genest copied his cast list. In 1869 William Thomas Lowndes enumerated four 17th-century quarto edition of Julius Caesar: those dated 1684 and 1691, plus two undated editions, to which he assigns the dates 1680 and 1696. Thus a supposed 1680 quarto, hinted at by Genest and now cited by Lowndes, came to be considered the first edition of Julius Caesar. It is readily distinguished from the other undated quartos by the spelling “Nuw Exchange” in the imprint, among other features. Library catalogs and bibliographies perpetuated its first edition status for the next forty years. When W.A. White bought his copy in 1892, authorities were in agreement as to its primacy. The date 1680 has been written in pencil on the title page and stamped in gilt on the spine of this copy, by White himself or a previous owner. Then in 1913 Henrietta C. Bartlett published in The Library the case for situating all four undated quartos between the 1684 and 1691 editions. She reaffirmed this position in her Census of Shakespeare’s Plays in Quarto (1916), co-edited by Alfred W. Pollard, and again in Mr. William Shakespeare, Original and Early editions of his Quartos and Folios (1922). This is the sequence Harvard College Library catalogers had in mind in 1929 or slightly later, when they assigned to the W.A. White copies their present call numbers. But by 1939 Bartlett had thought better of the matter, writing in the revised edition of the Census: “There were four undated editions of this play issued after the first edition, 1684, and the second, 1691.” And yet Bartlett’s prior conclusion stubbornly endured. W.W. Greg’s Bibliography of the English Printed Drama to the Restoration (1951) cites only Bartlett’s 1913 Library article, and HOLLIS is most assuredly not the only library catalog to have persisted for decades in an outdated description of these quartos. It is possible that by 1939 Bartlett had hit on the line of reasoning that John W. Velz would bring to bear in his 1969 article “’Pirate Hills’ and the Quartos of ‘Julius Caesar,’” published in the Papers of the Bibliographical Society of America. Velz argues that while the sequence posited by Bartlett in 1939 is essentially correct, there is more to the story. Yes, the four undated quartos were almost certainly all issued later than 1691, but one of them was issued quite a bit later. According to Velz, three of the four undated quartos were piracies issued around 1695 by Henry Hills Jr., the notorious pirate printer and sometime government informant who had years earlier printed the legitimate 1684 quarto for Messrs. Herringman, Bentley et al. The last of the four undated quartos Velz assigns to an unknown pirate printer working around 1714. It was a clever scheme, as Velz explains: “If he were accused of piracy he could plead that he had bought these quartos as remainders at the sale of Henry Hills’s stock in November 1713.” This assessment has been accepted by the editors of the English Short Title Catalogue and other authorities, conferring on his piece the aura of being the final word on the subject. Yet Velz claims no such certainty. “’Pirate Hills’ and the Quartos of ‘Julius Caesar’” is a model of judicious scholarship, replete with phrases like “there can be no certainty,” “plausible explanation”, and “full of contingencies.” He would, I think, be the first to admit that much work on these quartos remains to be done, and that crucial facts remain to be discovered. Below are the title pages of all six quartos, in the order of publication posited by Bartlett and supported by Velz. 13408.108. The first quarto edition, 1684. 13408.108.35. The second quarto edition, 1691. 13408.108.5. 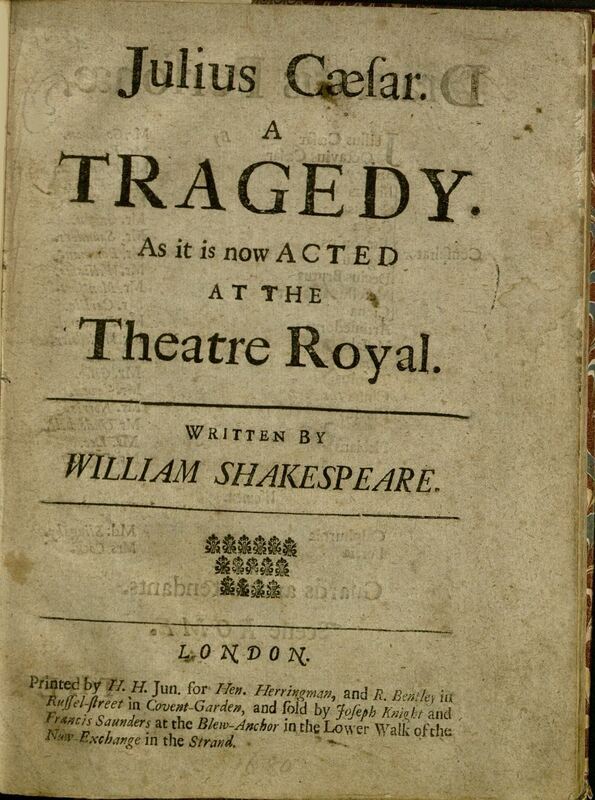 The third quarto edition, ca. 1695? 13408.108.10. The fourth quarto edition, ca. 1695? In this copy, the date ‘1680’ is written in pencil on the title page, and also stamped in gilt on the spine, reflecting the judgment of 19th-century bibliographers. 13408.108.15. The fifth quarto edition, ca. 1695? This copy was once owned by John Genest. 13408.108.20. The sixth quarto edition, ca. 1714? Bartlett, Henrietta. Quarto Editions of Julius Caesar. The Library, vol. 4, 1913, pp. 122-132. Genest, John, et al. Some Account of the English Stage: from the Restoration in 1660 to 1830. Bath, Printed by H.E. Carrington : Sold by Thomas Rodd, London, 1832. Greg, W. W., and Stationers’ Company. 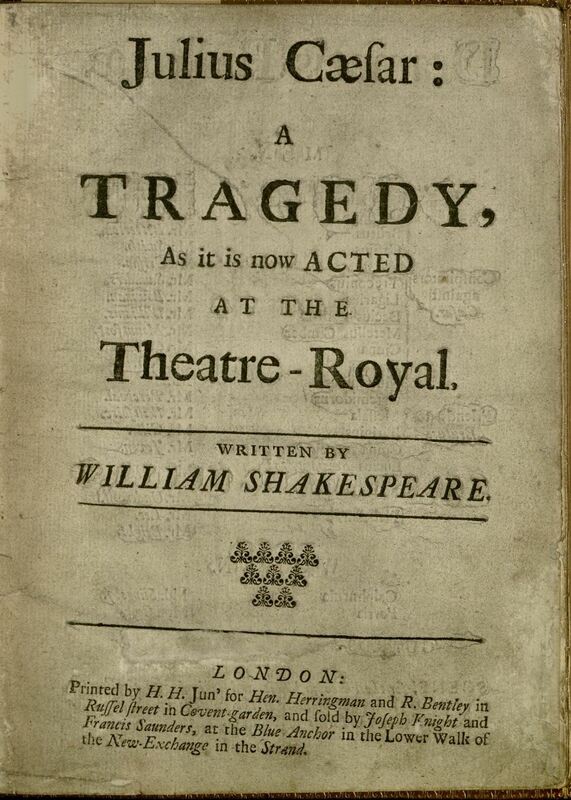 A Bibliography of the English Printed Drama to the Restoration. London, Printed for the Bibliographical Society at the University Press, Oxford, 1939-1959. Langbaine, Gerard, et al. 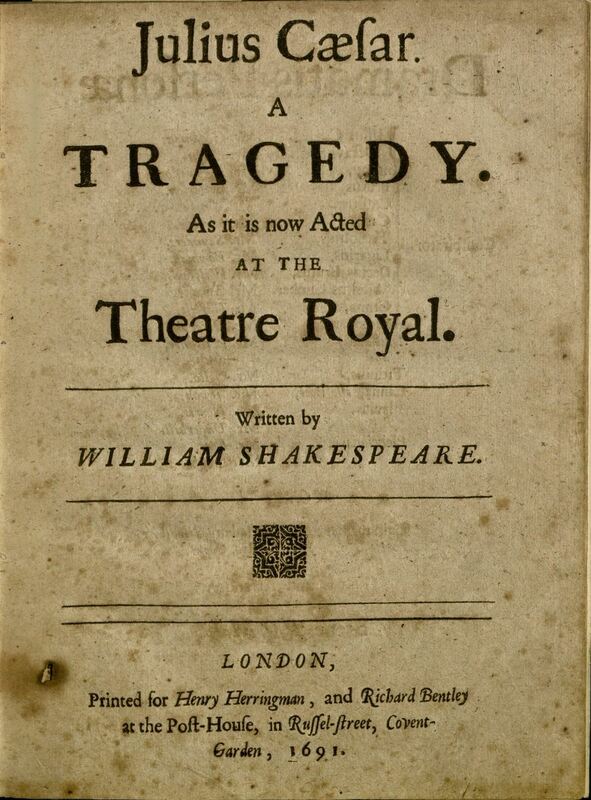 An Account of the English Dramatick Poets, or, Some Observations and Remarks on the Lives and Writings of All Those That Have Publish’d Either Comedies, Tragedies, Tragi-Comedies, Pastorals, Masques, Interludes, Farces or Opera’s in the English Tongue. Oxford, Printed by L.L. for George West and Henry Clements, 1691. Lowndes, William Thomas, and Bohn, Henry G. The Bibliographer’s Manual of English Literature. London, Bell and Daldy, 1869. Velz, John. “’Pirate Hills’ and the Quartos of ‘Julius Caesar’” The Papers of the Bibliographical Society of America, vol. 63, 1969, pp. 177-193. What a wonderful piece of scholarship combined with cataloging. I love the clever title and the beautiful moment in which the barebones record is transformed, revealed in its new, fully-realized plumage. Also, I was very happy to see the use of “therefrom” herein.